After working on the same boring thing all day, no one can blame you for taking a well deserved break. Distractions can be valuable because they give your brain a chance to recharge and concentrate even better when you continue. With the amount of content and information now accessible to the average person, choosing what to have has become like trying to have a snack at a buffet table. There’s so much out there that, unless you’re very picky, you’ll be missing out on some great stuff. When you consume content, you are feeding you soul. And feeding your soul good and wholesome food is as important as doing so for your body. So what’s good and what’s not so good for you? 1. TV dramas/sitcoms. Think back to the shows you were watching last year. Has it contributed to you as a person today? Did you learn anything valuable? TV shows are entertaining whilst we’re watching them but it’s not until it finishes or gets cancelled that we realise what kind of things we could have accomplished if we spent all those hours differently. Studies have shown that filling your life with trashy TV about people arguing, cheating and lying, can lessen your sensitivity to the consequences of doing so. Watching shows about crime, murders and blackmailing can make you more paranoid and afraid than the reality. I’m not saying all TV is bad, or that we should cut it out altogether. I am a big fan of a few series (ahem, Grey’s Anatomy), and of course a lot of documentaries are very informative, but TV is supposed to be ‘entertainment’ – meaning something to occupy you for a few hours a week. It’s not supposed to be a part time occupation or a way to numb your brain. 2. Evening News. The news obviously cannot report everything that happens in the world, so it has to be selective. Unfortunately, more people are interested about robberies and murders than charity runs. The news has become a medium that dramatises negative events to increase audience ratings. Just check out the front page of any news site and count how many times the word ‘death’, ‘dies’, ‘killed’, ‘stabbed’ and so on appear. Again, of course we should be aware of what’s happening in the world around us, but in my opinion there’s no need to know about every single thing. Sometimes, it feels beautiful to be disconnected. If another Michael Jackson dies, you’ll hear about it, don’t worry, you don’t need to keep looking out for it. 3. Facebook. It’s a great way to keep in touch with friends, but how much do you need to know about them on a daily basis? Most people have hundreds of friends on facebook, so it’s simply not possible to keep track of what they do anyway. A lot of the time, people live in fear of missing out, so they think their lives would be better if they know what’s going on all the time, but deep down they know that this is simply not true. Letting go of the need to always know what’s going on at this very minute is the key to freedom. Ignorance is bliss. 4. Repeats. This year, I’ve made a quiet promise to myself that I will try not to watch any repeats – especially films. One of my friends is a media student and they’ve opened my eyes to just how much there is out there that it seems silly to watch another rerun. There are literally thousands of fantastic independent films, classic films, controversial films, historical films and breakthrough films that I’ve yet to see, why should I ever re-watch something I’ve seen before? So what should you do when you want to sit back and relax? Prepare for the link fest. Balance in Me – well written tips about how to find balance in a busy world. Change your Thoughts – redesign how you think about life. Daily Mind – Eastern wisdom brought to the west. Marc and Angel Hack Life – how to be more productive and happy, one of the best blogs I’ve ever found. Stepcase Lifehack – a collaborative blog full of great tips from successful bloggers. Zen Habits – who has never included Leo’s blog in a ‘best of blogs’ list? Becoming Minimalist – contains some pure gems. miss minimalist – We would definitely be best friends if we ever met. mnmlist – another great creation of Leo Babatua’s. stonesoup – combining my two loves: minimalism and food. Lifehacker – …needs no explanation. The Peak Condition Project – my favourite fitness blog in the world. Patrick knows what he’s talking about. Zen to Fitness – simple and quick health tips. Scott H Young – hundreds of articles on life and productivity for students. 2. Follow daily reminders. These get a category of their own because they are so inspiring. The Mindfulist and The Mindfulist’s twitter – reminding you to be aware of the little things that matter. Makes Me Think – thought provoking life stories in one sentence. Thought Questions – asking the right kind of questions. Buzz Out Loud – a technology podcast I’ve been following for years. Nutrition Diva – dispelling common myths about what is good for you and what isn’t. Zencast – A comprehensive collection of Buddhist talks. The 7 Habits of Highly Effective Teens – the book that started it all. Young Guns – by Robert Tuchman, a guide for fearless young entrepreneurs. The Art of Happiness – one of HH Dalai Lama’s most widely read books. The Power of Now – by Eckhart Tolle, changed the way I thought about thinking forever. The Way of Zen – by Alan Watts, who was one of the first people to demystify Zen and bring it to the west. The Definitive Book of Body Language – by Allan and Barbara Pease, a down to earth and humorous guide. What Every BODY is Saying – by John Navarro, an ex FBI’s tips on reading body language and detecting deception. How To Win Friends and Influence People – by Dale Carnegie, simply classic, which is why it has stood the test of time. Despite what a lot of people are saying these days, consumption of media and information isn’t necessarily a bad thing. What really matters is doing it right and mindfully choosing the best kind of things to feed our soul with can make all the difference. This entry was posted in Hacks, Productivity, Technology on May 30 2010 by Jessica. Chopsticks. Right now, millions of people are digging into their food with two sticks that have stood the test of time as a utensil for humans, even when countless thousands of other tools, gadgets and products haven’t. But what’s so special about them? What can we learn from mere chopsticks? 1. Simplicity. They can come in all kinds of colours and sizes but essentially they are just two long sticks. There’s hardly anything more simple than two bits of wood being pushed together. With new technology being released everyday and adverts bombarding us with the need to be able to do more with less, multi-tasking and multiple-use devices, it is sort of refreshing to still have something which has just one use – simply to eat. Chopsticks are a living example that simplicity simply works, and we don’t need to keep developing, improving and fixing things all the time. 2. Versatility. 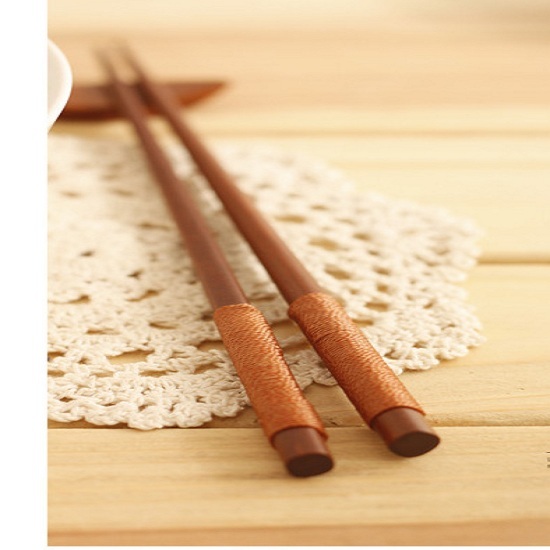 Chopsticks can be used for picking up all kinds of food; meat, veg, rice, even the bones from fish, because by nature, their simplicity means that they are adaptable. Instead of aiming for a niche in an attempt to find a ‘gap in the market’, or to fill a hole that probably doesn’t need filling, they cater to a wide range purposes. Imagine being like chopsticks in this way, able to appeal to many people because you are useful, without worrying about being ‘more innovative’ or ‘better’ in anyway. They just do what they are made to do, they just are. 3. Aim. If you’ve ever tried using them, you know that you can’t get what you want by just haphazardly stabbing at the plate. To be able to get what you want, you have to aim for it. There’s no way you can pick up everything in one go. Know what you want, and just do it. Sometimes, a little bit of focus makes the difference between failure and success. 4. Practice. Using chopsticks doesn’t come naturally. You have to learn to use them and practice it. But how will you learn? Should you just read about it? Most would agree that there’s no better way to practice than to look at the delicious food in front of you and tell yourself that you can’t have any until you can use the chopstick to get it. In real life, you can read as much as you like about all the things you want to do, but it will just amount to dreams and theory if you don’t try actually doing it. Don’t just watch others eating, put yourself out there and give the chopsticks a go. 5. Slowing Down. A common health tip is to try to eat with chopsticks when you can. Why? Because it slows you down and allows your stomach to tell your brain your’re full before you overeat. Eating with chopsticks is a slower process, but that is not necessarily a bad thing. Sometimes we need to slow down and take things one step at a time, break it down at each stage so that we have time to think, to realise that we’re actually full and that we don’t have to keep charging full speed through life. Sometimes it’s nice to enjoy each morsel of life as it comes. This entry was posted in Health, Life Lessons, Minimalism on May 23 2010 by Jessica. Right now, I’m in the midst of exams, so you could say they’re on my mind. I thought I’d share some ways minimalism helps me make studying easier. 1. Get rid of the unnecessary. Use the 80/20 rule as a guideline: probably only about 80% in the syllabus will actually come up in the exam. That means that if you study everything, roughly a fifth of it would be a waste (if your goal is purely to pass the exam). Because of this, try to identify which areas are the most important, using tips and clues given by the lecturer and look back at things you have covered extensively in class. Don’t just work blindly memorising from the textbook, be savvy and try to get your hands on past papers and become familiar with exactly what they’re looking for. 2. Simplify. Make life easier by breaking things down into small manageable steps. Draw mind maps using different colours to lay everything out. Mind maps are great because the general rule is that you can only use one or two words per branch. Spread out, try not to cram too much on one page and embrace the white space. Giving yourself room calms your mind and allows it to think with more clarity. You might even find recalling things easier if you can remember the layout of your notes. Download mind mapping freeware here. 3. Know the fundamentals. Even if you don’t think you know everything in terms of scope, taking care of the essentials is just as important. Lecturers tend to set questions that seem complicated, but they are really just testing if you know the basics. Make sure you know them like the back of your hand. You can even make an activity out of it by making a poster summarising the formulae, key points and basic steps and putting it up by your mirror. 4. Focus. Decluttering your desk can make all the difference in your concentration levels. Clear everything off and only put on what you need for the next hour. Chances are you’ll only need a book or two, a pen and paper. If you’re not using your laptop, it might be best to hide it that as well so you’re not tempted to get distracted. 5. Disconnect. Now that I’ve switched to Chrome, I use the StayFocused extension to cut down on the time I spend on facebook and twitter. I finally found an extension that actually works and does a pretty good job at keeping me on track. It even has a ‘nuclear mode’ which blocks all websites for as long as I want. I also turn off my iPhone or at least put it on silent. I have never encountered a situation when I got a call or text that had to be answered immediately anyway. I hope these tips helped! If you’re in the middle of exams too, I wish you the best of luck. If you have any more suggestions, please share them with everyone in the comments! This entry was posted in Hacks, Minimalism, Productivity on May 20 2010 by Jessica. For some it’s a simple question. Do you know how much your life costs? I’m not asking how much your life is worth, of course the answer to that is that it’s priceless. But how much does it cost? For businesses, this is a very important question. As individuals, we may not have the responsibility of looking after shareholders, but nevertheless there is no reason why we shouldn’t keep a watchful eye on our life overheads. If something should happen, say you lost your job or other income, would you be able to reduce, adapt and survive? Or would you go under? As a general rule, the biggest difference between those businesses that made it through the recession and those that didn’t was the ability to change, reorganize and cut down on spending to the most minimum amounts. Many of them came out of the other side much less wasteful of resources and ran at their most efficient in years. The Problem: Being trapped in a job you hate. As a teen I could only land menial jobs, which made me feel like a tiny cog in a giant corporate machine. I was trading each hour of my life away for cash. I felt like I had a price on my head, and it wasn’t very high. So I quit. I felt I had learnt a lot, and gained some valuable life experience but in the end, working like that wasn’t for me. And since being at university, the fact that I don’t have a job has freed me up to concentrate on my studies. However, there are some that don’t have such luxuries (excluding those who don’t have a choice). Although they hate their job, they can’t quit or even cut back on hours because they wouldn’t have enough money to pay for petrol in their car or to feed their buying habits. The Solution: To survive, I found alternative routes of income and I reduced my life overheads. I’ll save it for a future post about how I make money (I can assure you it’s perfectly legal!). But, basically I changed my life when I became a minimalist. I ride a bike instead of driving or taking the bus, I found ways to hang out with my friends for practically free, and I learned to live happily with what I already have instead of buying new stuff. The Problem: Either we don’t even realise what we’re spending until it’s too late or we constantly worry about going into overdrafts and repaying debts. Being completely unaware of the problem is a recipe for disaster but on the other hand constantly worrying about it isn’t going to solve anything by itself. The Solution: Reduce. Simplify. Change. There are people that can’t imagine life without a car, shopping for new clothes every weekend or going out clubbing three times a week. If you spend a lot, you need to earn a lot to sustain your lifestyle. If you simply cut down on you wants, you don’t have to give up as much of your valuable free time working for money, or your well-being becoming stressed about it. Don’t overfeed the ‘want’ monster and sooner or later it’ll stop being greedy. The Problem: We’re pressured to spend our whole lives trying to accumulate money. Our society has trained us to be constantly attached to money that we don’t even realise we are. We always carry money around, we spend it everyday (even if you don’t buy anything today, you’re still paying for rent/bills) and most of the time we’re working or studying for a ‘secure future’ which basically means we expect to earn more money in the future. Money money money. The Solution: Just let go. Let go of your need to collect money. Be content with what you have now. Everyone knows that money doesn’t equal happiness, but they just need to believe it. Stop worrying and thinking about the future all the time. The future isn’t here yet, but the present is. I’m not advocating throwing everything you’ve worked for out the window, just that every once in a while, remember that you are already rich. This entry was posted in Happiness, Money on May 16 2010 by Jessica. You have enough. If you’re reading this post, the chances are you have a roof over your head, food to put on the table and even your own computer with an internet connection. You may not be a millionaire, but you don’t have to be. We are told our whole lives that we don’t want to fail at life. What does that mean? Apparently it means we don’t want to go through life without a job with a posh title, a big house and a flashy car. But what if everything we’ve been told is wrong? What would happen to us if we decide we don’t want to be trapped in the rat race? And the key to freedom? It’s contentment. It doesn’t mean you shouldn’t strive to achieve your best or not try to change anything. It means just being happy with where you are now, and stop trying to grasp onto something in the future that keeps moving forward just a quickly as we do. Just like a donkey trying to get the carrot on a stick, we would never reach happiness if we keep chasing something that moves away just as we think we’re getting closer. 1. Remember that: “I have lived x number of years without y”. When Steve Jobs released the iPad, people couldn’t really decide what they needed it for until they got one. Then they magically found all sorts of uses for it. A lot of the time, we create reasons to want stuff so that we can make the excuse that we need it. But we really don’t. We’re just trying to justify a new purchase so that we don’t feel guilty spending lots of money on more junk. Some things are useful, and really do grant us freedom, like the washing machine, but that was invented decades ago. 2. Don’t depend on stuff for security. Many people feel the need to be surrounded by stuff as if they need to affirm that they are working for something. My parents are very guilty of this. I love them very much, but because of their extremely poor background, they simply cannot throw anything away. They feel the need to hoard things because getting rid of it ‘would be a waste’. Even though we have enough money now to buy something many times over, they have created an emotional attachment to things that they need to feel ‘safe’. They’re scared that if they don’t have anything, then everything they’ve worked for has amounted to nothing too. If only they could realise that this doesn’t make any sense. They didn’t work for stuff they worked for us, they’ve built a wonderful family, and that’s something that can never be thrown away. 3. Stop needing to prove yourself. The amount of stuff you have isn’t a measurement of your worth. Almost everyone says this, and yet almost no one follows it. Just because a person has a nice kitchen, or their car has a bigger engine, doesn’t mean they’re better. People feel the need to acquire money as if they’re points in the the Game of Life and whoever has the most at the end is the winner. Real life isn’t like that. The real measurements are intangible things like kindness, generosity, love, knowledge, experience and happiness. That’s the kind of stuff Life is made of. Just be content with what you have. Be happy right now. Then you don’t have to go chasing for it. This entry was posted in Happiness, Minimalism on May 8 2010 by Jessica. …But don’t worry, by bathroom I basically mean the toiletries and lotions and potions I use. After all, how minimal can you go with basic hygiene?! When it comes to bathroom products, I try to keep everything down to just a few products that I can find cheaply and anywhere. I’ve been through phases of buying really expensive stuff, to going without and I’ve found both ways kind of unnecessary. For example, I used to spend a lot of money on hair products, thinking that the more I spend, the more it will look like a celebrity’s hairdo. Similarly, I used to buy really expensive make-up, telling myself that I’m paying for better quality. But after a while, I just realised that I was literally flushing money down the drain and simple, cheaper products will do the job just as well. On the other end of the scale, I’ve gone without a few products such as moisturiser and my skin felt the consequences, no matter how much I kept hydrated! 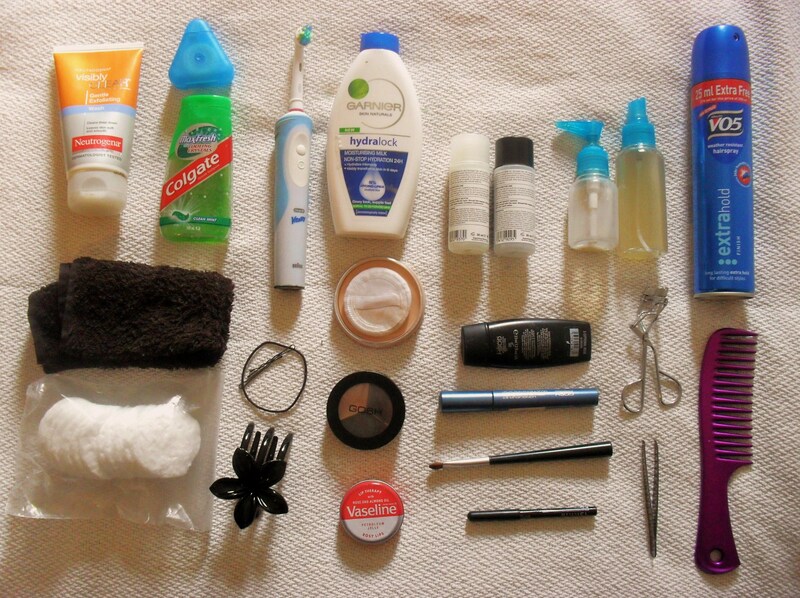 So here is everything I use, although I have left out a few things that should be available anywhere I go anyway, such as toilet paper, sanitary and body towels and handwash. To be honest, it is possible for me to live with even less stuff than this but since I’m not travelling at the moment, there’s nothing wrong with having a few more bits and pieces, like I’ve said before, minimalism is about only having what you need, not going without to the point that you are suffering! Whenever I’m staying somewhere apart from home, I literally take just the essentials, namely my makeup, moisturiser and toothbrush. I think it’s in the ‘bathroom area’ that women differ from men the most. Guys can do things like cut their own hair or go without hair altogether! There are some women who have shorter hair and do this and I really admire them for it. However, I’m just not as awesome as them, so inevitably, I have to spend time and money on haircuts, products and getting ready in the morning. But I don’t mind too much since I know that I have pushed the costs down to the minimum. It’s quite comforting to know that everything I need to take care of myself would fit into a small bag that I can take anywhere. Do you have any minimalist bathroom tips? Let me know! This entry was posted in Minimalism on May 2 2010 by Jessica. Welcome to Minimal Student, a blog about living life fearlessly, constantly learning, and exploring what it means to be human. What is minimalism? You can find out via minimalism 101, checking out the most popular posts, or reading this TL;DR. Minimal Student runs on the kind support from readers like you. Please spare what you can to keep it going! Thank you.